First is the worst and second is the best! Well, that isn’t quite the case here, because the midsize Altima sedan is the best-seller followed by the compact crossover Rogue which is the second best-seller in the Nissan lineup. Returning for 2017, the Nissan Rogue has been refreshed in a number of ways inside and out to make its design even more modern and attractive and its technology offerings even more impressive. The biggest news for the 2017 Nissan Rogue in Glendale Heights, IL is that it will be available as a hybrid for the first time ever. The hybrid system will be offered in addition to the standard 2.5L 4-cylinder gasoline engine that is paired with Nissan’s continuously variable transmission. Available as a front wheel drive or all-wheel drive vehicle, the Nissan Rogue is one of the more versatile family crossovers we implore you to explore. A few changes have been made to the Nissan Rogue’s exterior; 17-inch, 18-inch, and 19-inch wheel designs have been introduced in addition to updated front and rear fascias. New LED boomerang signature taillights were added while new integrated fog lights were added on either side of the V-motion grille. The 2017 Rogue Hybrid uses a system that combines a compact lithium-ion battery with a “one-motor, two-clutch” control along with a 2.0L 16-valve DOHC aluminum-alloy inline 4-cylinder engine. The Hybrid is able to earn 33 city/ 35 hwy mpg while horsepower is rated at 141 HP with 144 lb-ft of torque. The previous Nissan Rogue models were equipped with crash-prevention, advanced safety systems like Lane Departure Warning and Blind Spot Warning, but the 2017 model now adds Intelligent Cruise Control, Forward Emergency Braking with Pedestrian Detection, and Departure Warning. The Nissan Rogue has transformed into a sleek and modern crossover with dependable utility and flexible style to fit the needs of families and drivers who lead active or busy lives. Its design is meant to make a statement and it does an excellent job of holding down its spot in the top rankings of the compact crossover segment. Colors: Available in three additional eye-catching colors, the Rogue’s exterior color palette in total includes: Palatial Ruby, Midnight Jade, Pearl White, Caspian Blue, Monarch Orange, Brilliant Silver, Gun Metallic, Magnetic Black. Trim Levels: As we’ve mentioned above, there now is a Hybrid version of the Rogue available which grows the number of versions the compact crossover is available in to four. Beginning with the base level model and going in order, there is the S, SV, SL, and SL Hybrid. Seating/Cargo: Classified as a compact crossover, the Nissan Rogue seats five passengers, but does offer a third row of seating that would bring the seating total to seven. Continuing into 2017, the Rogue still of course does an excellent job of creating more than enough space for passengers and cargo items. Better yet, the EZ FLEX Seating System and Divide-N-Hide cargo system both make it easier to stash, store, and access cargo without compromising your passengers’ personal space. 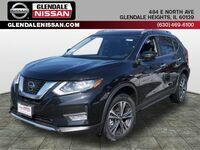 To learn more about the 2017 Nissan Rogue, we would like to welcome you here to Glendale Nissan. We would be happy to answer any questions and welcome you to take the 2017 Nissan Rogue for a test drive. Interested in a 2017 Nissan Rogue?